Manage your NFL.com Fantasy Football teams on the go. The official NFL.com Fantasy Football app lets you perform crucial fantasy tasks from anywhere! 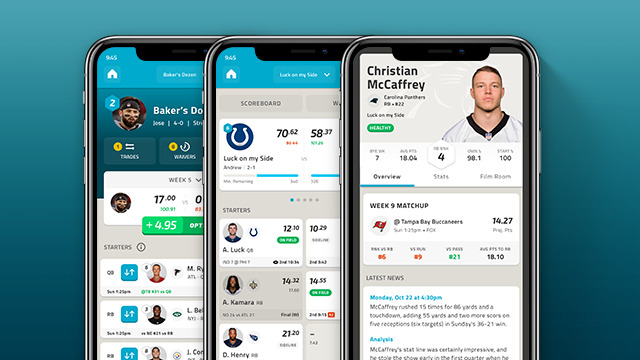 100% redesigned and rebuilt for 2018, the all-new official fantasy football app of the NFL is compatible with your favorite smartphone or tablet device. And yes, this season you can draft your team on the go! Live Draft on the go: Draft your team in-app, with support for standard, auction, live draft lobby and mock drafts. Join and Create Leagues - Join and start playing fantasy football in just a few minutes. Video Highlights - The only fantasy app to feature in-game video highlights of all your key plays. Live Scoring - Watch your NFL.com Fantasy scores update in real-time. Set Your Lineup - Start or bench players on the go. Team Management - Now wherever you are, you can add/drop players and even propose/accept trades for all of your NFL.com Fantasy teams.